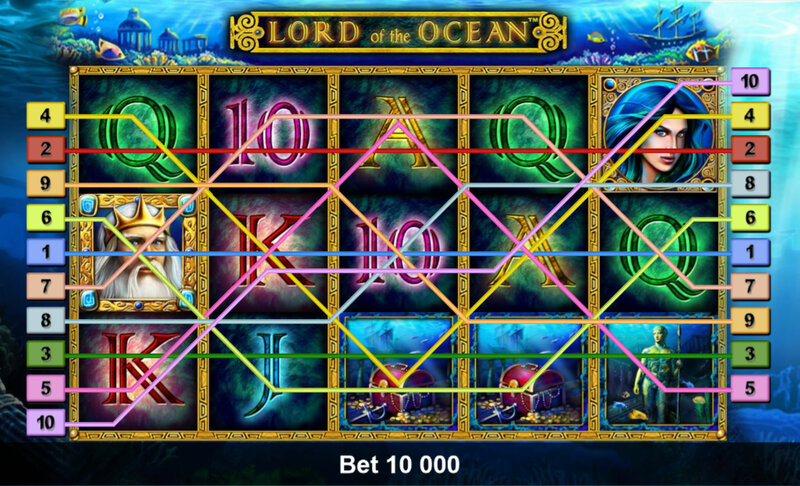 A game that is sure to stick in our memories for a lifetime is Novomatic’s Lord of the Ocean that has been circulating for years in casinos throughout Europe. This game is by far one of the best they have ever produced and to this day continues to excite and delight players. It is now not only available for play at brick and mortar casinos but also online allowing us to play in the comfort of our own homes. 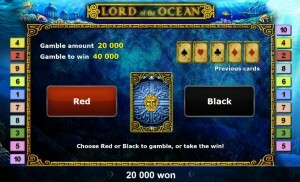 Since players had been entertained by The Lord of the Ocean, it was only natural that Novomatic Slots should decide to make it part of their online offerings. What really set this game above the multitude is the high quality graphics and outstanding features. It is considered to be one of the most pleasing games visually that Novomatic has developed. 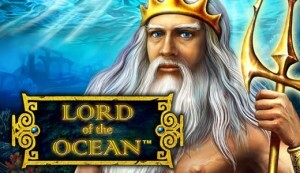 In game play, The Lord of the Ocean is almost an exact replica of the popular Book of Ra Deluxe. Besides its similar classic feel to the popular Book of Ra, this is a game we should all enjoy for many reasons. 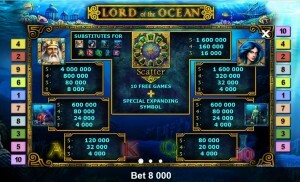 Come take a ride inside the Nautilus and enter the unknown depths of the sea by playing the Lord of the Ocean slot game. We aren’t there for the appreciation of the underworld’s flora and fauna. Instead, we are looking to run into a place filled with underwater adventure and treasure. We find it through the action of this fascinating and colorful game in the undersea world based on ancient Greek mythology. According to Greek mythology, Poseidon is the God of the Sea who protects all aquatic things. He is the mysterious Lord of the Ocean also known as Neptune. However, in this online game, his appearance promises big prizes! 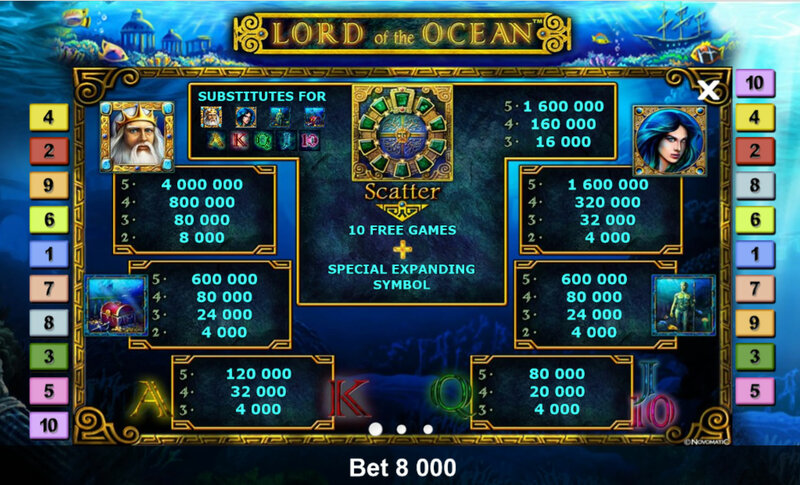 Both the land based and online Lord of the Ocean slot game have 5 reels and 10 payline games. Wilds, expanding wilds, free spins and scatters are all offered in this game. All of these are strategically placed giving players a good chance to win. Adhering to this theme, the game’s reels include symbols of Poseidon, a Goddess, Mermaids, Jewel Adorned Amulets, warriors, Treasure Chests and the Gate. Since The Lord of Ocean (Poseidon) is the main symbol, it brings the player the biggest win, and the goddess follows with the next biggest win. The sea symbols are animated and some have their own unique sound bites. The game also includes less superior symbols that bring less in winnings. These include the common, card-playing symbols often found in slot games, A, K, Q, J, and 10. The object of the game is to line up at least three, four or five identical symbols on one of the ten paylines to get a win. 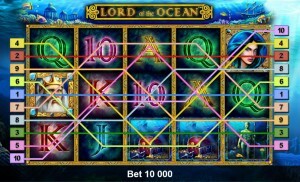 The Lord of the Ocean symbol pays the highest for a win. Winning combinations start on the first left reel and continue to the right on a win line without any interruptions. Different amounts are won by the different kinds of fish, and the greater the number of fish you line up the bigger your win becomes. The Lord of the Ocean Gate Symbol is the wild and can, therefore, replace any of the other symbols except for the scatter in order to complete a winning combination. The Warrior Amulet is the scatter symbol. The scatter symbols can appear anywhere on the screen and don’t have to be lined up on one payline for a win. Three scatters will reward a player ten free spins. If three or more Gate scatter symbols appear anywhere on the screen’s reels, you will be taken to a bonus round where you will get ten free games. Before the spins start, a special expanding symbol is randomly chosen. During the bonus game, this symbol expands to cover the entire screen every time it appears. This means that by spinning five of the symbol chosen you will be paid ten times the value because there are ten win lines. In addition, the free games can also be triggered again. This game also has a gamble feature. With the gamble feature, you can double your win by guessing the correct color of a hidden card. The card can be either black or red giving you a 50% chance to double your win. Everybody enjoys winning and the Lord of the Ocean Slot Game offers fantastic ways to win in online casinos as well as spectacular entertainment. With a payout percentage of over 95%, this game certainly offers players great winning opportunities such as the outstanding bonus and gamble features. The spectacular entertainment is provided by its captivating theme based on Greek mythology and high quality graphics. Give the game a try for free or for real money, and you will be happy you did.